When my oldest son was going to have his third Christmas, I wanted a fun way to go through the Christmas story with him that year and for years to come. That was back in the heyday of counted cross stitch, so I decided to create an "heirloom" advent calendar to tell the story of Christmas to him, and hopefully, future siblings. My sister-in-law, Lois, designed cross stitch patterns and made up kits to sell for extra money, so that made me brave enough to work on my own design. I finished it all that year except the background--which took the next 22 years and the advent of a grandchild to motivate me to finish! I chose ten different people and events from the Biblical Christmas story to highlight that I hoped would help our children understand the true reason for Christmas and who Jesus is. I created a design for each person or event to be put up on a ten day advent calendar that included a Bible passage to read. I also found a Christmas carol that reinforced the message to sing after we did the reading. When the kids were little we had to be very careful about keeping track of whose turn it was to attach the figure to the background via the Velcro stickers or there could be some very un-Christmas-like attitudes! In their teen years apathy was "cooler" than excitement about it, but even when we had all grown kids and no grandchildren, they wanted us to do the devotionals. Most years we fell behind on the daily readings one or two days because of some other Christmas related activities but we just doubled up on a other days. That didn't matter, the point was to remember and reflect on the Biblical Christmas story. I'd like to encourage you to consider creating your own Christmas advent devotional to help your children think more about Christ than presents. Even if you don't cross stitch or do other crafts, this kind of devotional would be easy to set up, using a hobby store or Christian bookstore. You could buy a shadow box to fill with nine, ten, twelve, or, if you are really energetic, twenty-five items that you find in the hobby story or Christian bookstore. At my granddaughter's Sunday school they had ten stickers they put on paper key tags to hang on a small tree. Another way to work this would be a nativity scene that you add one figurine to each day. One friend has the wisemen start out in another room and slowly advance through the house each day till they arrive at the stable. How ever you do it, your kids will love the novelty and listen more attentively to the original Christmas story. And don't forget the carols, even if you can't sing, (I can't at all!). Some we really enjoy and some we laugh our way through when my voice cracks (which is often), but those words will stick with your children all their lives and will be an important part of their Christmas, no matter how far they stray. I am now working on one for my first two grandchildren. It's in year two of work, but I hope to finish before the oldest's third Christmas next year. 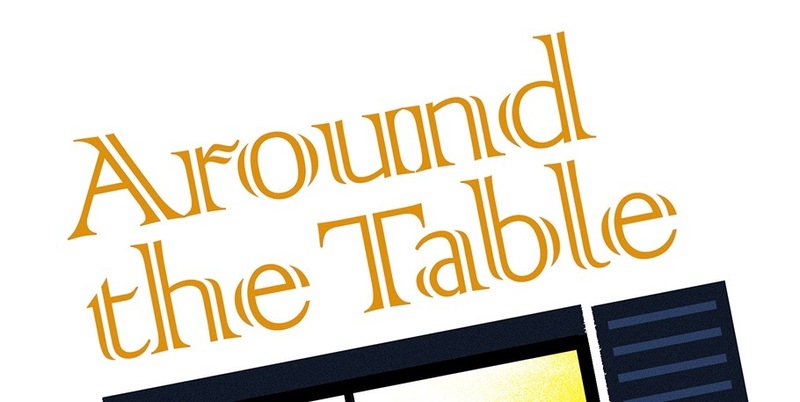 Don't forget to like the Around the Table Book Facebook page to get a conversation starter every weekday! We always did advent when I was a child and when my boys were little but yours takes it to another level for sure! What a wonderful idea to have created this all in cross stitch! Beautiful! Thanks, Debra. I had fun doing it--now I just wonder where I found the time back then! Love all these ideas. We usually use a purchased nativity advent calendar. This year we haven't been as organised and don't yet have one. My eldest was asking about it so have been dreaming up some ideas. These are great! Lizzy, I hope you think of a way to do something, maybe something a little--or very--different from other years. Thanks for stopping by! Thanks, Theresa. I hadn't picked up a needle in years either. I'm finding that when I sit down at the end of the day I'm often too tired to cross stitch. When I was younger I was good for a couple of hours! Thanks for the invite! Thanks, Wayne. The ones I'm doing for my grandkids are even nicer. Hopefully I'll have pictures of them next year! What a great idea. We've begun using an advent calendar this year. Actually, I had high hopes of crafting something beautiful, but only got as far as printing off the numbered circles and cutting them out. Nevertheless, we've done our family activities thus far and are enjoying finding new ways to celebrate Christ's birth. Glad to hear you've got such a rich tradition in your household and that your grandkids will be able to enjoy it soon too. Glad you are using an advent calendar with your kids and not letting Christ get lost in the other fun Christmas activities. Even if you can't craft something you may be able to find a nativity scene to use to help. Kids have fun with things that aren't elaborate! I just love the little figure set, so sweet and innocent and perfect for any child! Thank you. I'd like one that's not fragile for little hands though! The nativity sets are (from top to bottom) from Italy, Bolivia, and Colombia. Very cute and a fantastic idea! Thanks for coming by to look and for hosting the link up! Love it ~ I love the cross stitch! Thank you for linking up to Raising Imperfection. Thanks Lanaya! I'm enjoying the cross stitching again--but don't have energy like I did 24 years ago! Thanks for hosting the link! Great ideas! I do wish I was crafty, but alas my creativity is sorely lacking. But as I've said before, it doesn't matter when it comes to telling the story. Get a nativity set and wrap a piece up in a box every day for a child to open and tell or read the story and sing a carol. The kids will think that's just as fun! And, more importantly, they'll learn just as much. This is a great idea - even if a child lives in a home that doesn't share a Christian belief base. It's important to know the story. There are many references to Christ's birth in literature and our social media. What a fun way for a young person to learn about "the reason for the season." It's sad that so many places want to keep this story out of the season. It's part of our culture and literature and art! Thanks for stopping by, Denise. I love the Christmas - giving, receiving and the story, Christian belief behind it... all of it.